Previous radiation: In order to study whether a history of radiation influences outcome in meningioma surgery, “Radiation (Yes)” group was compared to those with no prior radiation with respect to outcome (GOS) (based on a review of 800 operative cases, personal series). A total of 93 patients had previous radiation. Many of these patients also had prior operations. 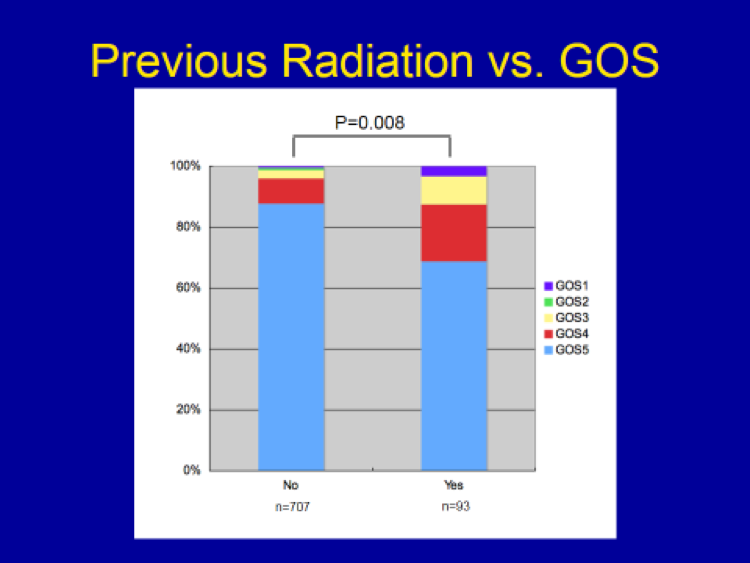 The incidence of “Good” outcome (GOS 4 & 5) patients goes down significantly from the “No radiation” group to the “Prior (Yes) radiation” group. Prior radiation, similar to previous surgery, causes scar tissue formation around the tumor, making exposure and identification of the tumor and the surrounding “normal” anatomic structures difficult and, at times, dangerous, adding to overall surgical risks. Patients with a history of previous radiation do less well following surgery.